Ok, first off – I think I would totally love to hang out with your mom! She sounds hilarious, fun, and like a very, very good eater. My kinda gal! 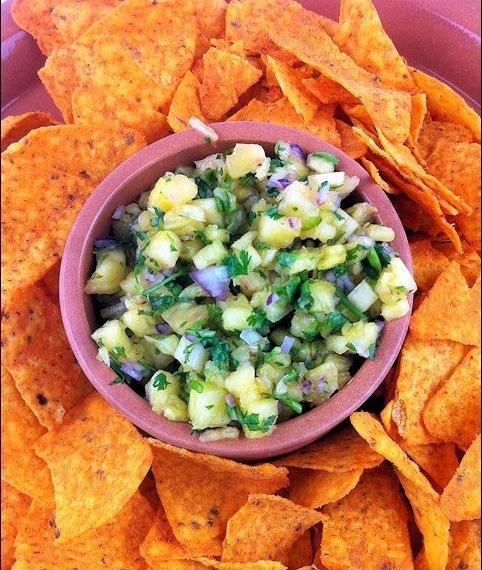 Secondly … this salsa … wow! What a unique flavor combination! So interesting and really gorgeous! Don’t worry about what your mom’s gonna say in her “teacher voice” – this is a great invention! Definitely pinning it now to share with our fans and followers! Thank you for the love, Shelley. I think you’re way cool, like my mom. She’s a no-nonsense type woman but a character… 😉 Glad you enjoyed this post. Now go get those chips! Thanks for stopping and linking this up with Saturday Dishes. I pinned it! 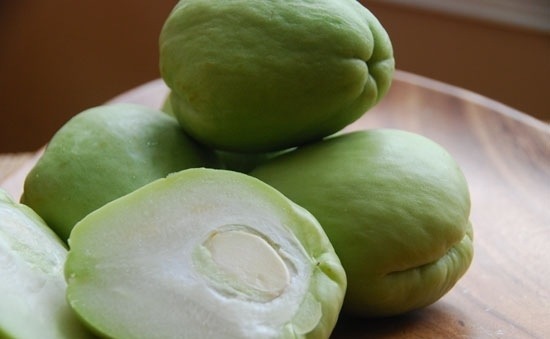 I have never heard of Chayote squash. What is it like? Thanks for sharing at Saturday Dishes and telling me about a squash I’ve never heard of. Hi Kerry, chayote squash sort of looks a bit like a weird pear. Most people peel the outside like a pear, but you don’t have to. It’s pretty mild and neutral in flavor, and holds the middle between cucumber and jicama. It has a crunchy, fresh taste and has a tendency to absorb the flavors of whatever it’s mixed with. It tastes very clean and fresh, truly a bit like cucumber. I’m in Southern California, so we’re spoiled with Latin markets and produce. If you can’t find it in your grocery store, maybe try a Mexican or Latin foods market? Good luck!